Rusty-faced Parrots (Hapalopsittaca amazonina amazonina) are endemic to the slopes of the eastern Andes in western Colombia from Magdalena Valley, Hulia north across Norte de Santender to south-west Táchira, northwest Venezuela; and Cundinamarca, Boyacá. This species favors primary forest areas, cloud forests, forests at tree level and podocarpus woods in temperate zone between 1,900 m (6,300 ft) and 3,500 m (11,700 ft). Occasionally they visit tall secondary vegetation. They are assumed to migrate regularly between altitudes and possibly seasonally in localities - depending on availability of food and nesting sites. This species is rare and occurs in localized, isolated groups. All subspecies are considered very endangered through habitat loss and are listed as Vulnerable due to widespread habitat loss caused by deforestation as land is being converted for agriculture, illegal drug plantations, infrastructure development and mining. Hapalopsittaca amazonina has three subspecies (including the nominate species) that occur in the Andes of Venezuela and Colombia. Note: The Rusty-faced Parrot (Hapalopsittaca amazonina amazonina) forms superspecies with the Red-faced Parrot (hapalopsittaca pyrrhops) and Fuertes's Parrots (Hapalopsittaca fuertesi), and all three have commonly been considered conspecific (of, or belonging to, the same species). The Red-faced Parrot and the Fuertes's Parrot were formerly considered sub-species of the Rusty-faced Parrot (Hapalopsittaca amazonina), but are now considered monotypic (either a genus consisting of only one species or a species without a sub-species). Description: Generally darker than nominate species. Forehead, chin and adjacent upper cheeks much darker reddish-brown. Distribution: Andes in Tachira and Sierra de Merida, northwest Venezuela. Description: Generally darker than the nominate species. The narrow band to forehead and lores (the regions between the eyes and bill on the side of a bird's head) are cream-colored. The remainder of the forehead, chin and adjacent upper cheeks are much darker reddish-brown. Distribution: Forest areas across Manizales on northwest slopes of Nevado del Ruiz Mountains, Caldas, Colombia. Size: Rusty-faced parrots are generally chunky and average 23 cm or 9 inches in length (including the tail). Adults: The plumage is mostly green. The abdomen and under tail-coverts are yellowish-green. They have a dull orange crown and pale yellow lores (the regions between the eyes and bill on the side of a bird's head). The orange-red cheeks have a yellow streaking. The olive ear-coverts (feathers covering the ears) are slightly elongated with yellow shafts. They have red shoulders. The outer median and secondary wing-coverts are dark blue. The tail is brownish-red with a violet-blue tip. They have blue secondary coverts and dark bluish primaries (= longest wing feathers). The underside of the flight-feathers are greenish-blue. The bill is horn-colored with a bluish-grey base. They have dark grey eye (periophthalmic) rings. The irises are greenish-yellow and their feet are dark grey. Young (immature) birds have yellow streaks to their ear-coverts and cheeks. The head is a duller red and the secondary wing feathers are green. 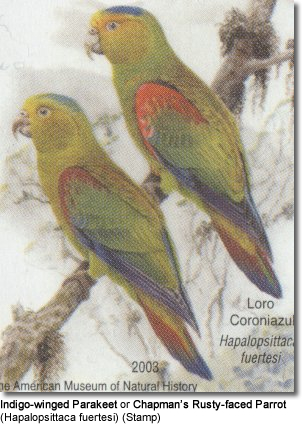 Look similar to the Rusty-faced Parrot, but the rear of the forehead and adjacent cheek areas are greenish-yellow. The chin is green and the crown is blue. The red on the wings is darker. The outer median wing-coverts have a pink edging. The hen looks like the amazonina female, but the red to the wing is darker and more reddish-brown. Several sympatric (of the same geographic region) Pionus Parrots could also be confused with the Rusty-faced Parrots; however, they are slightly larger with proportionately shorter tails. They also have a different flight action. Their diet consists of a variety of seeds, fruits (including berries), flowers, blossoms and shoots of various plants. They drink water from the tanks of bromeliads in trees. In their natural habitat in Ecuador, they breed from October to April. They nest in naturally formed tree cavities or woodpecker nest sites. Little is known about their breeding habits. In one case a nest with two eggs was found. The hen incubated them alone for about 26 to 28 days, leaving the clutch only for a short time every few hours to be fed by the male who guarded them from a nearby tree or the edge of the nest. Once the young hatched, they were initially fed every two hours; later on they were fed about four times a day. The young fledged when they were about 49 to 51 days old. Rusty-faced parrots make loud sheck-sheck sound, particularly in flight. Distribution: Frequent forest areas across Manizales on northwest slopes of Nevado del Ruiz Mountains, Caldas, in Colombia.